In stock 56 items in stock. Can these be used with Arduino or a Teensy circuit? I agree that the green is not nearly as bright as in the picture. Very nice buttons though. Don't know if it matters to any one, but I just picked up one of these and its not as bright green at it looks (at least on my monitor). Works great, has nice clicky feel. But isn't alien slime green. I am trying to fine button switches for a firing box for my firework displays. I think I only need a 2 post switch. Do you have to use all three contacts on the back of this switch? I plan on tying all the commons together and then have individual hot(s) going to certain lines going out to the fireworks. With that being said, would I be able to use a button like this for that project? You only have to use 2 of the pins. There's 1 common pin and the other 2 are for when you press the button vs when you do NOT press the button - so just make sure you wire the right ones ;) You probably CAN use these, though you might want to check if your firing system uses AC or DC. If it uses DC, you'd ideally want to find the ratings for the switch for DC (tends to be lower than for AC). Whether you'd want to use these for a fireworks display is another matter - there's probably more appropriate control boards specifically for the purpose? Yeah I think this will be more than capable, I am using a DC circuit wired for 6-12V @ 1.5 - 2 Amps. Thoughts? That really depends on the switch. As an example, here's a switch ( http://components.omron.com/components/web/pdflib.nsf/0/426FBC003DD57FE185257201007DD495/$file/SS-P_1110.pdf ) that is rated for 3A@125VAC - pretty close to this one. However, it's only rated for 0.1A@30V. 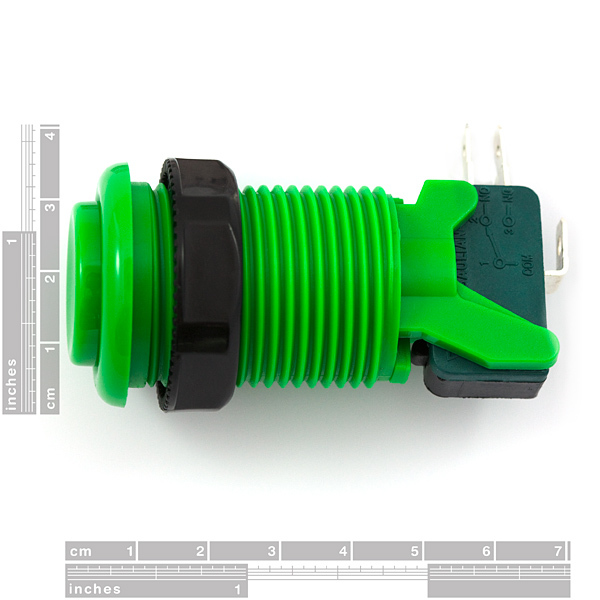 This one ( http://www.cherrycorp.com/english/switches/pdf/DG_Series.pdf ) on the other hand says 3A @125VAC vs 2A@30VDC (depending on model - there's 3 in there with wildly varying ratings). Unfortunately there's no datasheet given for this switch. Mind you, it'll probably switch it - it just might wear out (a lot) faster. Well I am only using this maybe one big show a year and only "switching" the buttons twice during that show, so for the 1.95 do you think it would worth the risk? The DC switches I have found only come in common black whereas I would love to have my channels color coded. Even if I could get 2-3 years out of the switches I would be willing to replace as needed. Again how significant do you think the loss of life of the switch would be? Man I wish these came with a spec sheet! prooooooooobably, I guess it mostly depends on how the innards behave, but with that little usage I wouldn't really let it bother too much. The worst that could happen is that the plastic catches fire. That's not good, obviously, but hey.. you're there, you're doing a fireworks show, I'm sure you know how to handle fire ;) Slightly less worse is that the switch fails and your fireworks don't go off. You presumably do a dry run first to make sure wiring/switches are all correct before hooking up the igniting elements anyway? 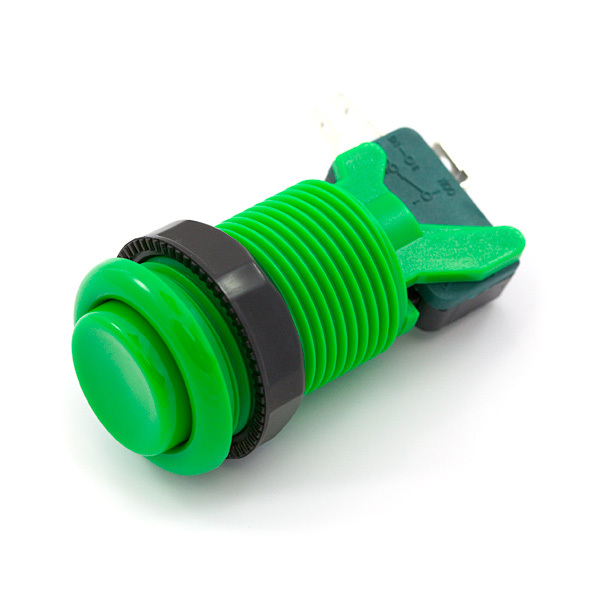 A datasheet would be nice, regardless - couldn't find one.. did find out these (or buttons that look a lot like it) are very popular in the home arcade scene and come in quite a few more colors. I will probably roll the dice as is, then worst case senerio if they do fail change my circuit and use an inverter to change the DC power source into a AC curcuit. I will check all switches prior to show time, to make sure all are wired, and working correctly. I will only have to press and hold the button down for a split secound, so I guess I will cross my fingers, I might but just a few and try them over and over before I buy enough to build the entire board. This might be a dumb question, but, do these work with DC? They do indeed! The switch itself doesn't care if you're running AC or DC through it. But it's good practice to pay a little attention to the rating. For the small logic-level DC voltages and currents you'll typically run through these, the 3A 120VAC rating is more than adequate. But if you ever want to run serious amounts of DC through a switch, do some research on derating AC current levels to DC levels (or find a switch that also has a DC rating). The reason is that high-wattage DC is much more likely to weld switch contacts together than the same AC current and voltage. (This has to do with the fact that AC voltage turns on and off 60 times a second, which helps prevent such welds from forming, but you get the idea). Of course; no offense intended to our friends all over the world.